Hedgehogs often scratch a bit when they first wake up or after they are handled. One might compare this scratching to fluffing out a “bed head” hairdo. Hedgehogs’ skin may also feel tight or need to be scratched when their spines are out of alignment. Some hedgehogs scratch when nervous or exploring. Again, you may see this habit in humans. Quilling also can cause scratching because new spines working their way through the skin cause discomfort. Dry or dirty skin can also cause scratching. A bath and olive oil treatment (or our skin care oil) should help alleviate both these problems. Check out the Quill Loss and Quilling, Dry Skin, and Bathing Your Hedgehog articles for more information on these topics. People typically think first of mites when they see their hedgehogs scratching. Loss of quills with flaky roots rather than healthy root bulbs. Visible mites or mite droppings. Scratching enough to leave marks. 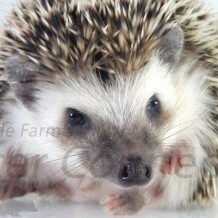 A trip to the vet may be necessary if excessive itching continues or if you are sure your hedgie has mites. Check out the Mites & Other Ectoparasites article for more information on this topic.